It’s 2016, and while the law of the land may be that gay men and women can marry, we are not equal. We do not feel safe. We aren’t safe, not always, and now, not even in our sanctuaries. I’m angry that someone took the lives for 49 men and women. I’m angry that these people were in a place that they considered safe, and that the safety was taken away from them, that their lives were. I’m angry for the hundreds of others who were there who may never feel safe again. I’m angry for the 53 men and women who were injured, who were shot, some still fighting for their lives. I’m angry for the moms and dads and brothers and sisters and lovers and partners and friends. I’m angry that they probably knew for hours that the person they loved was gone but didn’t know for sure and held out hope, because that’s all we can do in moments like this. I’m angry for the potential that was lost. I’m angry for the ones who were still trying to find their way and now, never will. So. Here’s what I think is important to talk about. The gunman, Omar Mateen, from what we know right now, wasn’t a member of ISIS, and wasn’t killing people in the name of his religion. We cannot demonize people of any faith after something like this. We’ve done that for far too long in this country. I worry for my Muslim friends. I’ve never met a violent or vindictive Muslim person in my life. As a gay man, I’ve always felt loved and accepted by my Muslim friends. Violent sects exist in other religions, too, and we don’t demonize them nearly as much as we, as a country, have demonized Muslims. So stop. This conversation is about so much more. This conversation is about hate crimes. It’s about the fact that a man targeted gays and lesbians and bisexuals and transgender people and their allies. Let us not forget this. He did not target “Americans,” as some reports are saying, but he targeted the LGBTQ community. Mateen was American. He was born here. He was not an outsider who came into our country to take away Americans and strike fear into us like the attacks on September 11, 2001. From what we know, he saw two men kissing and was outraged enough to coordinate an attack on a gay nightclub. Let us not, in any of our talk about the Pulse shooting, the largest mass shooting in the history of our country, erase that fact. Let’s also, please, not forget that this happened during the club’s Latin night, that many of those killed and injured were people of color. I’m not sure if Mateen had that in mind, if that was a motivator, but please, can we we please keep this as part of the conversation? This conversation is about safe spaces. It’s about a marginalized group of people, a group that is told by many faiths that we are sinners, a group that is at higher risk for being abandoned by their families, a group that is at a higher risk for being the victims of hate crimes. It’s about how these people—people who may not be comfortable in their homes or at work, or who may feel as if they can’t breathe in large groups of people—were in their safe place, somewhere they could forget their worries, forget their feelings of inadequacy or the fears for their safety, a place where they sought comfort and friendship and people just like themselves, people who understood what it felt like to fear walking down the street alone because that’s where a gay hate crime could happen. A gay bar isn’t just a bar—often, a gay bar is a site of activism, a place where gay community fundraisers are held, a haven in an often-scary world. Remember to respect them. The conversation is about empathy. I’ve seen people talk in the media and on social media about how they “hate how there’s all this grieving from people who didn’t know any of the victims.” I don’t understand that argument. We are all humans. An attack like this is personal to so many for various reasons. It was personal to me. I lived in Florida for five years. I have friends who live in Orlando, gay friends who have gone to Pulse, who frequent it. I’ve been to Pulse. I go to gay bars. I have friends who lost friends on Sunday morning. I have friends who know grieving parents and partners. The conversation is about guns. A gun was the weapon that killed these people so yes, it’s about guns, and seriously, why does anyone need an assault rifle? I was in Georgia, visiting my family for my nephew’s second birthday, when I saw the news. My family sat and watched it. My sister eventually went off to care for my nephew. My mom walked away at parts to tidy the house or cook. My brother-in-law, who I was supposed to run errands with, waited with me so we could watch President Obama make his statement. I don’t know if they understood how much this affected me, how I couldn’t unglue myself from the TV, why I was quietly wiping my eyes. They were affected, sure. They’d be monsters if they weren’t. But they don’t understand why this was so personal to me. I don’t know what to say to them, to my family. I want to scream and make it political. I want to scream and make it about anything but politics. I want to hug my friends. I want everyone to feel loved and safe. I want to put everything petty aside and clear up any misunderstandings with anyone I’ve ever had in my life and say, “Let’s start over, let’s be better,” because the Orlando tragedy puts everything else into perspective. I want to kiss my boyfriend in public and dare anyone to come after us. I want to march in the Chicago Pride Parade in two weekends and not have to worry that something horrible could happen. I want to feel safe when I walk into my neighborhood gay bar. I want to not have to talk about Orlando because I want it to never have happened. I want to send money to all the families of victims. I want the gay community and our allies to band together and raise money to pay for all of these funerals, to have memorials erected, to somehow let these people know that they mattered and that we, as a community, are strong. 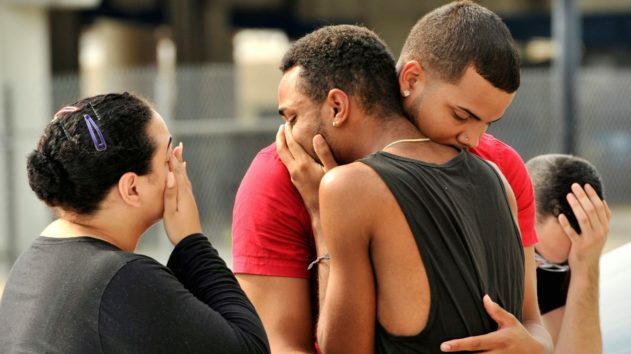 Our brothers and sisters died, some gay, some straight, some bisexual; some white, some black, some Latin; one, a mother, out supporting her son and his friends; all people, and no matter their stories, their accomplishments in life, their ages, their mistakes in life, they didn’t deserve this. To Stanley Almodovar III, Amanda Alvear, Oscar A. Aracena-Montero, Rodolfo Ayala-Ayala, Antonio Davon Brown, Darryl Roman Burt II, Angel L. Candelario-Padro, Juan Chevez-Martinez, Luis Daniel Conde, Cory James Connell, Tevin Eugene Crosby, Deonka Deidra Drayton, Simon Adrian Carrillo Fernandez, Leroy Valentin Fernandez, Mercedez Marisol Flores, Peter O. Gonzalez-Cruz, Juan Ramon Guerrero, Paul Terrell Henry, Frank Hernandez, Miguel Angel Honorato, Javier Jorge-Reyes, Jason Benjamin Josaphat, Eddie Jamoldroy Justice, Anthony Luis Laureano Disla, Christopher Andrew Leinonen, Alejandro Barrios Martinez, Brenda Lee Marquez McCool, Gilberto Ramon Silva Menendez, Kimberly Morris, Akyra Monet Murray, Luis Omar Ocasio-Capo, Geraldo A. Ortiz-Jimenez, Eric Ivan Ortiz-Rivera, Joel Rayon Paniagua, Jean Carlos Mendez Perez, Enrique L. Rios, Jr., Jean C. Nives Rodriguez, Xavier Emmanuel Serrano Rosado, Christopher Joseph Sanfeliz, Yilmary Rodriguez Solivan, Edward Sotomayor Jr., Shane Evan Tomlinson, Martin Benitez Torres, Jonathan Antonio Camuy Vega, Juan P. Rivera Velazquez, Luis S. Vielma, Franky Jimmy Dejesus Velazquez, Luis Daniel Wilson-Leon, and Jerald Arthur Wright, may you all rest in peace. May your families find solace. May your names remind us to all be better to each other.